Unique and one of a kind, this wedding gown is intricately beautiful, glamourous and sophisticated. Sweetheart strapless bustier with thin pearl detailed straps, and off the shoulder detachable cuffs for the arms. A contemporary lattice style bodice, with inner boning/structure for support. No need to wear a bra as breast cups have inner padding. Trumpet style flare above the knee /on thighs flatters the backside and waist, giving way to a breath-taking 1.5m train. Generously decorated with a plethora of hand-embroidered flowers and leaves/filigree, pearl clusters and crystal beading. The lattice detail and bust has small flowers that then cascade down to the skirt and bigger flowers lower skirt and hem. Sheer white organza and white flower lace, overlies the Oyster/Mushroom colour underlay which has a luxurious satin feel underneath it. Furthermore underneath lies tulle and another inner silk lining. This was worn in conjunction with a second gown, and due to quickly having to change on the night, one of the arm cuffs was sadly lost. 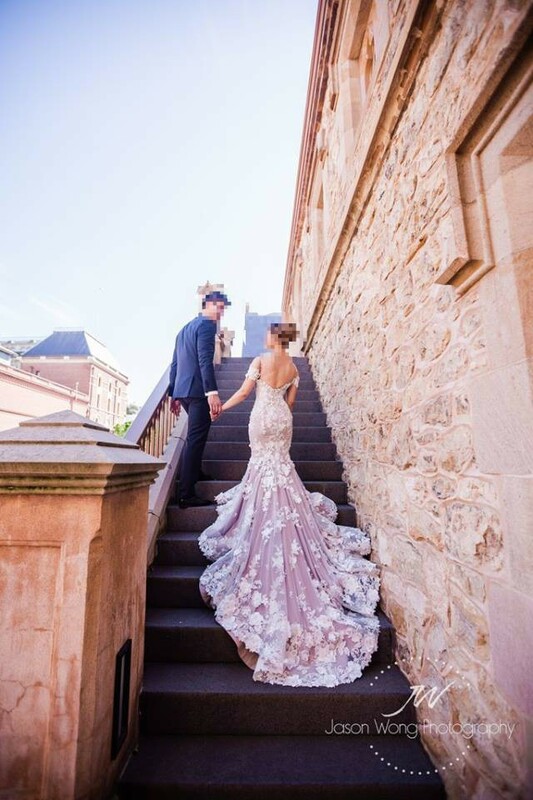 However the remaining arm band will be included, so that a replacement can easily be replicated by Steven Khalil, or any Dressmaker with new material, and utilising a few flowers from the dress. Equally as exquisite, the dress can be worn without the detachable arm cuffs. This is also why I have put the dress at such a reduced price. The train has a button ribbon / loop attachment so it can easily be taken up / shorted for the 1st dance or evening reception. The veil itself is worth $1100. It is cathedral length, pure silk organza and has stunning pearl detail over the upper portion of the veil and embossed all over the clip tie. So pretty. All original receipts will be provided upon purchase to verify price and authenticity. Dress was worth $14,000. Together with veil, $15,100. Comes with all original receipts, tag and professional Steven Khalil dress bag. Pick up in Sydney, or can be boxed and posted for a fee. Carefully preserved and dry-cleaned, this gown is truly a show stopper, finely crafted, elegant and refined. Please contact me if interested and I will respond promptly.